What Is The Norwood Scale & How Bald Are You? The Norwood Scale is a classification system used by the medical community to standardize hair loss. Standardization of baldness is important because it allows experts to diagnose the extent of the baldness, strategize treatment, and finally assess its effectiveness. This is the most widely used classification system mainly because it applies to the majority of men experiencing male pattern baldness. Also known as the Hamilton-Norwood Scale, it was first proposed in 1951 by James Hamilton. However, in 1975 O’Tar Norwood modified and refined the original classification system. Because Norwood’s work was so significant, the scale is now simply named after him. The Norwood Scale is basically a series of images that can be referenced to figure out which stage of male pattern baldness you’re currently in. In this Norwood Scale Guide, you’ll find images and descriptions of each of the stages of this classification system so that you can determine the extent of your problem. Since your objective behind using the Norwood Scale is to understand your problem better, we’ve included some other useful sections in this guide as well. For example, we’ve described other classification systems that will help you if you don’t fit into the prevalent Norwood Scale. We’ve also explained the methodology used in the medical community when using the Norwood Scale as well as tried to shed some light on other common questions surrounding male pattern baldness and the Norwood Scale. Feel free to jump around to various sections of this guide with the following navigation panel but we suggest going through every section. What Are The Primary Stages Of The Norwood Scale? Are There Other Stages Of Hair Loss on the Norwood Scale? Does The Norwood Scale Apply To Women? How Quickly Will You Lose Your Hair? Why Are You Losing Hair in This Pattern? How Do They Diagnose Pattern Baldness? Are there Other Hair Loss Patterns? There are seven primary stages or ‘types’ in the Norwood Scale and most men experiencing male pattern baldness seem to qualify for one of these stages. The stages are primarily image-based which is why we recommend checking the provided images while reading our descriptions of each of the stages. Type I: This stage is the starting or zero point in the scale. It is treated as the zero point because it represents no significant hair loss or recession of the hairline. For this reason, this stage is also often called the ‘Juvenile Hairline’ stage i.e. the stage where your hair looks the same as it did when you were a teenager. While it isn’t unheard of, very few men reach older years without progressing beyond this stage. Type II: This stage could describe nearly all men between the ages of 20 and 30. It signifies mild recession of the hairline around the temples as a result of natural aging. This is why this stage is often referred to as the ‘Mature Hairline’ or the ‘Adult Hairline’ stage. It is important to note that men that qualify for this stage are still not considered to be experiencing male pattern baldness. Type III: This stage signifies the presence of male pattern baldness. If the state of your hair qualifies you for this stage, then you’re experiencing from male pattern baldness, albeit at the very beginning of the condition. The defining feature of this stage is loss of hair on the temples and the expansion of the forehead, resulting in shapes like ‘M’, ‘U’, or even ‘V’ above the forehead. Some men may even end up with an island of hair as the receding line from both temples meet behind a tuft of hair on the forehead. Type IV: As male pattern baldness progresses, it causes loss of hair on the vertex or top of the head along with further recession of the hairline. There may or may not be sparse hair on the vertex at this stage. However, the receding frontal hairline and the bald patch at the vertex will remain separate in this stage. 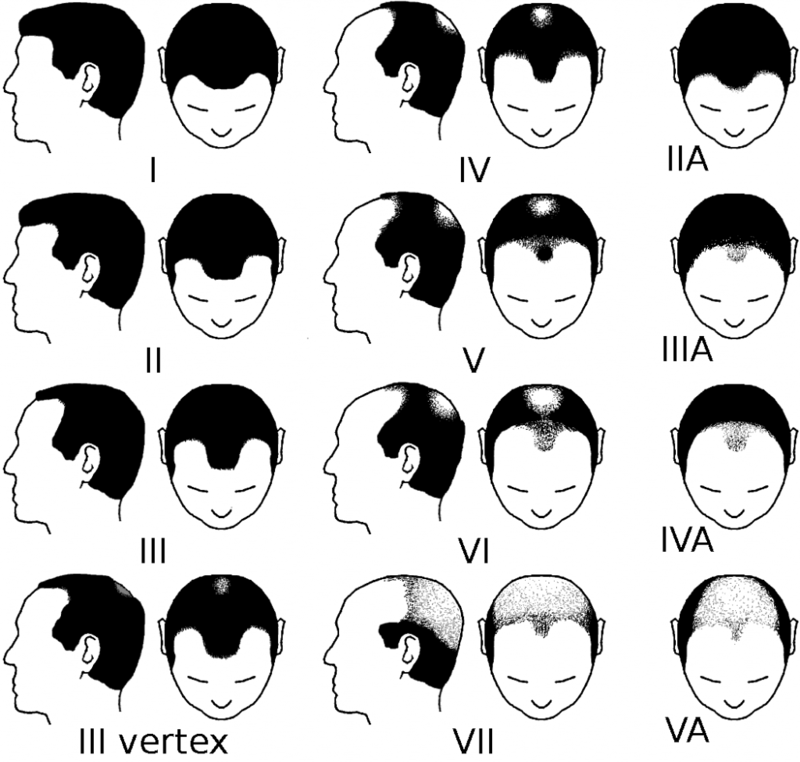 Type V: In this stage, the loss of hair at the vertex and the receding hairline are still separate but closer to each other. This means that they’re divided by a thinner line of hair than what was seen in the previous stage. Basically, they’re on the verge of merging. Type VI: In the sixth stage, the vertex bald patch and the receding hairline have merged even though there may be a few strands of hair in the middle. Type VII: This is the severest stage depicting male pattern baldness. By this stage, the receding hairline and the vertex bald patch have merged completely. The individual will be left with only the crescent of hair around the sides and back of the head. Further, whatever hair is left behind will be thin and wispy. There are four more stages in the Norwood Scale. These stages aren’t as common as the above mentioned seven stages. At the same time, they are extensions of a few of the above mentioned stages. Type II Vertex: It is completely possible for you show signs of male pattern baldness even before the third stage. This kind of pattern is very rare, however. In this stage, you won’t see loss of hair from the temples or even the top of the forehead. Instead, hair loss will begin at the vertex of your head. Therefore, this stage is typified by a mature hairline and slight balding at the vertex. Type III Vertex: This stage is also considered to be the first stage to show male pattern baldness. However, the typical temple, frontal hairline recession is not present in this stage. Instead, in this stage, hair loss begins at the vertex and gradually moves towards the front. Type IIIa: The ‘a’ subtype was used by Norwood to denote ‘anterior’. The difference between the ‘a’ subtype and the normal type is that hairline recession is uniform. This means that the initial hair loss isn’t focused at the temples but instead the entire hairline above the forehead. Type IVa: The hairline recedes further but uniformly without any emphasis on the temples. The vertex also starts seeing hair loss but the two remain separated from each other. Type Va: The bridge between the vertex bald patch and the receding hairline is virtually insignificant at this stage. The head has sparse hairs without there being any clear demarcation between the receding hairline and the vertex bald patch. There is no rule that says that the Norwood Scale doesn’t apply to women. However, it is incredibly rare for a woman to exhibit pattern baldness the same way that men do. Women experience pattern baldness will start losing hair at the top of their head. Usually, it can be seen as a widening or broadening of the parting. The medical community uses a different classification system for female pattern baldness. The system is called the Ludwig Scale and was developed in 1977. The scale consists of three stages. Stage I: In this stage, hair loss is mild. In fact, it can be mild enough that many women ignore it. Typically, the hair starts thinning instead of receding in any particularly direction. Thinning results in the scalp becoming visible over time. Stage II: The severity of hair loss increases in the second stage, going from mild to moderate. The density and volume of the hair continues reducing because the hairs are either getting thinner or falling off. By this stage, balding has become evident as scalp becomes more visible. Stage III: By the third stage, significant hair loss has occurred, resulting in a considerable amount of scalp being visible at the top of the head. Generally, hair on the side may get thinner but hair loss on the sides rarely reaches a point where the scalp becomes visible. It is worth pointing that hair loss as per the Ludwig Scale could show up in males just like hair loss according to the Norwood Scale can show up in women. This is the big question that most people experiencing balding are interested in. The honest answer is that there is no way to know. The rate of hair loss can vary greatly. More importantly, it can fluctuate from one period to another and doesn’t remain constant. For instance, you could reach stage III of the Norwood Scale by the time you’re thirty and not reach the Stage VI or even VII for the next 40 years. On the other hand, you could be free of all signs of male pattern balding till you’re 50 and then go through the stages super-fast till you’re completely bald. Further, your diet and lifestyle have a huge impact on the rate of hair loss. How balanced your meals are, how much stress you feel, how much rest you get, which kind of hair products you use, etc. All play a role in the rate of hair loss. This is good and bad. It is bad because you can’t predict hair loss. It is good because it means that you have a chance to slow the rate of loss down by making some key changes. Lifestyle and dietary improvements can help greatly. What can help even more is treatment in the form of either Minoxidil or Finasteride. While you can make lifestyle and dietary improvements independently along with even Over-The-Counter solutions, you may want to see specialists if you want to try prescription strength treatments. The answer to this question is related to the mechanics of female and male pattern baldness. Pattern baldness occurs because a substance called Dihydrotestosterone (DHT) attaches itself to your hair follicles. DHT is a derivative of the hormone testosterone. Men produce testosterone much more than women which is why pattern pattern baldness is more prevalent in men than women. Pattern baldness is the direct outcome of excess DHT and testosterone.In men, it is natural for testosterone levels to increase after puberty. In women, excess testosterone is caused due to hormonal imbalance that may occur because of any number of reasons. However, pattern baldness also has a genetic component to it. It is hereditary in nature which means that if your family members are balding then you have a predisposition towards it too. At the same time, it is only a predisposition and not a definite fact that you’ll go bald because your family members are bald. The genetic predisposition, however, is important. If you’re genetically predisposed towards pattern baldness, it means that your hair follicles have increased sensitivity to DHT. Therefore, when testosterone levels rise in your body, it affects your hair follicles more. Because of their interaction with DHT, hair follicles gradually shrink in size. This means that the hair they produce shrinks in size too. As a result, the hair becomes thinner, weaker, and more brittle. The hair follicles continue to shrink till they go completely dormant and can’t produce hair anymore. The reason why hair loss occurs in the patterns described in the Norwood or the Ludwig Scale is that hair follicles in those regions of the scalp are more susceptible to increased DHT than in other parts of the scalp. However, the follicles on the side of your head are still susceptible as the hair in those locations gets thinner over time. They’re just not as sensitive to DHT as hair follicles located in the temples, the front hairline and the vertex. Male pattern baldness or female pattern baldness can only be diagnosed in one way i.e. a physical exam of your head and your medical history. Generally, the specialist will evaluate the state of your hair and peg you into one of the stages on the Norwood Scale. This evaluation can range from measuring the regions where you’ve lost hair to actually pulling out some hair so that the specialist can analyze the condition of your hair follicles. You should also expect to be asked questions about your lifestyle, dietary habits, and medical history so that other transient causes for your hair loss can be ruled out. While the Norwood and the Ludwig Scales are most prevalent for evaluating male and female pattern baldness respectively, they don’t contain all patterns of hair loss. Here are two others. Diffuse Patterned Alopecia (DPA): If the way you’re losing hair doesn’t seem to match any in the Norwood Scale, it is possible that you’re experiencing Diffuse Patterned Alopecia or DPA. In DPA, you don’t start losing hair in any one region. Instead, your hair thins everywhere equally with some emphasis on the top or vertex of your head. Over time, you’ll see your scalp becoming visible in a way that is quite similar to Type VI or VII in the Norwood Scale. Diffuse Unpatterned Alopecia (DUPA): It is possible to lose hair without any distinct pattern too.This condition is called Diffuse Unpatterned Alopecia or DUPA. In DUPA, you lose hair all over your head. Thinning occurs equally down the sides as on top and the hairline. DUPA is not only very difficult to diagnose but also treat, especially when it comes to transplantation. Just like there are hair loss patterns that aren’t included in the Norwood and Ludwig Scales, there are other classification systems as well. However, many of these are obscure and not in use. Therefore, if you’re looking to pinpoint the nature of your pattern baldness, it is better for you to focus either on the Norwood Scale, if you’re a man or the Ludwig Scale, if you’re a woman.